Being a regular reader you are aware that we eat a lot of soup, especially, butternut squash. I am always trying to perfect the recipe. I love the texture of this squash and how creative you can be with the ingredients; meatless, only veggies, pasta, creamy, no cream, just so many options. Don’t get me wrong, I love all the variations I make but am still longing for the perfect bowl. You know; thick, creamy (without the calories), not too sweet and slightly savory. Ninety perfect of the creamy textured soups I make do not have any milk or cream. I use the food processor (you can use a blender) to make them ultra creamy with less the calories. I am pretty sure I have come pretty darn close to perfection this time. I kept is simple ….butternut squash, shallots, garlic, veggie stock and ancho chili powder for some depth and a bit of a smoky flavor. As well I wanted to bring in a bit of the forest by adding a little more texture (I am a bit texture freak) so I made a medley of mushrooms that was lightly seasoned with olive oil, Maldon salt and a little Ezpeletako Bipera (Basque paprika) and served it as a garnish with the soup. The mushrooms were slightly spicy which was the perfect companion for the sweet butternut squash soup. The perfect soup to ease yourself into winter. What is your favorite way to cook butternut squash? Heat olive oil in a large soup pan, over medium heat. Add the shallots, turn heat to low, cook for about 5 minutes; stirring occasionally. Add the butternut squash and ancho chili powder, stir and let cook for another 5 minutes. Add the garlic and the stock. Bring to a boil. Lower heat to a low simmer, cover and let cook until very tender, about 25 minutes. It will depend on how large your chunks of squash are. Remove from heat and let sit about 10 minutes. Using a food processor or blender, puree in small batches, then combine back in the same soup pot. Gently reheat over low heat. Ladle into serving bowls and garnish with the mushroom medley. Serve. Eat. Gently clean mushrooms with a paper towel or mushroom brush. Do not use water or your mushrooms will become a water-logged sponge. Heat a drizzle of olive oil in a frying pan, over medium heat. Add the mushrooms. Stir occasionally and cook until slightly soft but still holding their shape, about 3 – 5 minutes. Sprinkle with the salt and Ezpeletako Bipera. 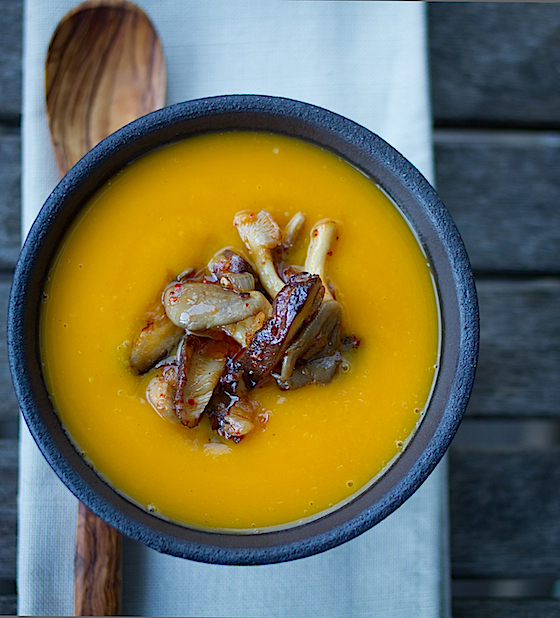 13 Responses to "Ancho Chili Butternut Squash Soup with Mushroom Medley"
That soup bowl looks like it's floating towards me -- it's going straight to Vancouver, right? :D Excellent shot. Your soup looks so creamy, I can't believe it has no milk and cream. I don't cook with butternut squash enough and I should! This is a gorgeous soup. It looks rich, creamy and perfect for fall. I think I have to go with soup as my favorite preparation. This may very well be it! Joy - it is so easy to make this soup creamy, just toss into the food processor. Perfect! El - I love making soups as well. We eat a lot of them during the winter, so get ready! I too, love the velvety creaminess of butternut squash soups. I had mu first one about 15 years ago, and was hooked immediately. I adore how simple this one is as far as ingredients, and the addition of the ancho and mushroom medley is a stroke of pure genius! Gorgeous shot, too. Thanks for the shout out! Wow. This looks amazing - I especially like that it's not overly sweet like some butternut squash soups. I was going to make a celery root-chestnut soup for a fancy dinner party this weekend, but maybe I'll make this instead. Of course, if I feature it on my own blog I will post a link to your site! wow, this looks so good!!! and it's pretty healthy too. no heavy cream. Shoot! I just made a butternut squash soup for a ladies gathering tonight. I used the curry family of spices but I LOVE the look of what you did here. And the mushroom garnish is genius. I truly love butternut squash soup - all versions - but the smoothness kind of bores me after a while. Gorgeous lady! Yum! What a great time of year to be cooking squash! Have you ever tried butternut squash risotto? It's my fave! Your soup looks so pretty with the mushrooms on top! Howdy would you mind letting me know which hosting company you're working with? I've loaded your blog inn 3 different browsers and I must say thjs blog loads a lot quicker then most. Can you recommend a good internet hosting probider at a fair price? Thanks a lot, I appreciate it!